Molly Caitlyn Quinn (born October 8, 1993), also known as Molly C. Quinn, is an American actress. She is known for her roles in the television shows Castle and the English version of Winx Club. She also appeared in the movie We're the Millers (2013). Quinn was born in Texarkana, Texas. She is of Irish ancestry. ↑ Quinn, Molly C. [MollyQuinn93] (4 August 2011). ""@AADaddarion1985: @MollyQuinn93 ur last name is Celtic/Irish? So u'r of an Irish descent, right? :)" Absolutely, Molly Caitlyn Quinn" (Tweet). 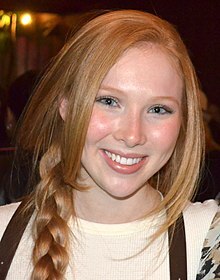 Wikimedia Commons has media related to Molly Quinn. This page was last changed on 11 December 2017, at 16:43.